How often have you given or received a gift in a jar? There's just something special about it no matter which end you're on. Here and here are a couple of examples. As wonderful as that all is, imagine something that's even better. wash the jars, heat the water, how long, what pressure, how much produce? securing food for winter, and usually saving money. We tend to get stuck in those niches without giving it much more thought. something deeper that we can't see. Recently, my mother-in-law asked if I wanted some canning supplies. They aren't doing that any more. Of course, I said, "Sure." if Mr. LB could drive the pick up the next day. They would be in town and would bring the canning things. She didn't think it would fit in the car. I laughed and asked if she was sure - note: never laugh at M-I-L.
She said, "Well, I think there are 16 boxes, 1 tote and a water canner." note: quit laughing at M-I-L - she's serious! Mr. LB drove the pickup to work and brought home the bounty. When I saw it all and remarked that I couldn't believe how much was there, not even blinking, he said that they had already give 21 boxes to a grand daughter! He is the youngest of five. I can't imagine how much food was prepared for each meal. His response to my shock was a casual, "Yea, Mom used to can a lot." It was the weekend before I was ready to tackle the pile of boxes. the good ones with air bubbles in the glass. Even some of the clear glass jars were old and had bubbles. that I called to thank her. That's when she asked, "I think there were some blue jars in one of the boxes." "Yeeeesss," I answered slowly as I looked at them drying on the counter. They were the first ones washed. She continued, "Could I have just one of them back?" She didn't need it, and I would get it back some day, but she would like one. (Actually, I think I laughingly said I would think about it just 'cause I'm ornery." But THAT'S what it is - whatever 'that' is. and by sharing the "pay" of your labor. There's something so special in that. Since then, I've rearranged, moved, and reevaluated things in the pantry. I've decided the blue jars will be for herbs. it will be a "gentle" use of the jars. a special gift, from me . . . to you. 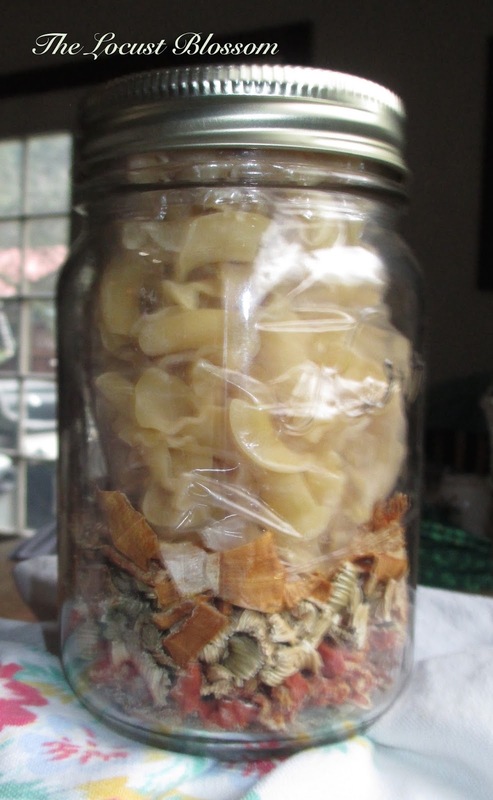 Layer ingredients in jar. If you lay the bay leaf on the top of the dried items, the pasta will stay on top better - depending on what pasta you use. and 3 c. chopped chicken. PS~ Sometimes I'll add dried peas or peppers or rice instead of pasta. If you've been around a while, you know I have recipe issues. you should know I consider a recipe as a general guideline. Last year's harvest so quite a few empties among them. I'm getting antsy to get out and play in the dirt again. What a dandy! And you wouldn't believe it, I just inherited jars this month also and redid my herb area. Post is on the way too! I would have got the chills when I opened the box to see those beautiful blue jars! And thank you for the mix gift recipe. You know I love those and will be adding to my pantry once I get the rest of those veggies in dried! Can hardly wait to see ~ your pantry is beautiful! How wonderful. A friend of mine gave me a bunch of old jars when he moved and I treasure them. Thank you for the recipe. I believe there is nothing better then home canned food. I couldn't agree more! A few things we do have to buy, like olives!!! And somehow I always run short on tomato sauce. What a wonderful gift! 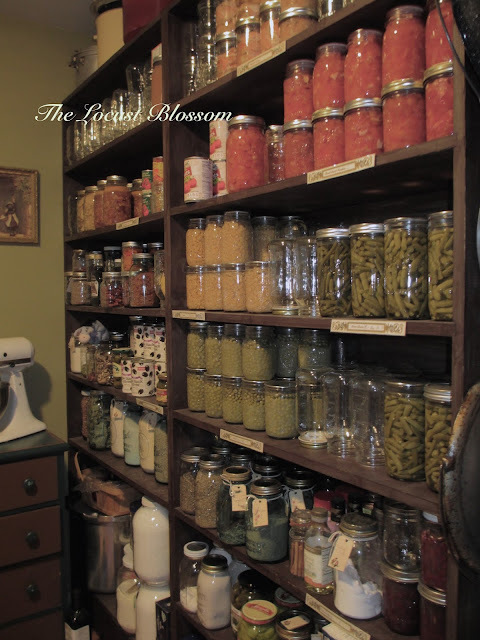 The stocked pantry is quite impressive. Thank you. Chicky-noodle soup is just yummy. Oh my gosh! I love your pantry. I pinned the photo to be sure I remember to come back to it for ideas. The dresser with the mixer stored on top is a wonderful idea. And the old jars - love them. What a gift! I love jars. This post brings back memories of when I used to can. I absolutely loved the smell of pickles and relish as they cooked. Alas apartment life (and no storage space) means my pickles now come from the store. I sure do:) I have a little ol' free-to-me dehydrator that works over time for a good part of the year. I will say, with celery, maybe de-string it before dehydrating. It rehydrates nicer. My husband loves old canning jars...he knows all of the "history" behind them. He has a collection of quite a few, I use them for dried goods, etc. What a wonderful gift! I love the blue jars. I have several that I have gathered at garage sales and farm auctions, but I would love to have one that belonged to my great-grandmother. She was a farmer's wife and canner extraordinaire! 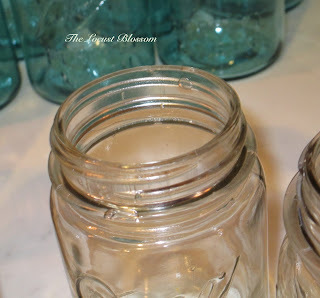 I am planting my garden this year with the sole purpose of canning. I can't wait! Maybe I should call my MIL real quick to see if she has any canning goodies stashed first though ;) Thanks for sharing on the Homestead Hop! How very wonderful jars are, and how they do connect generations! I am fairly new to canning...mostly jams, applesauce and pickles. 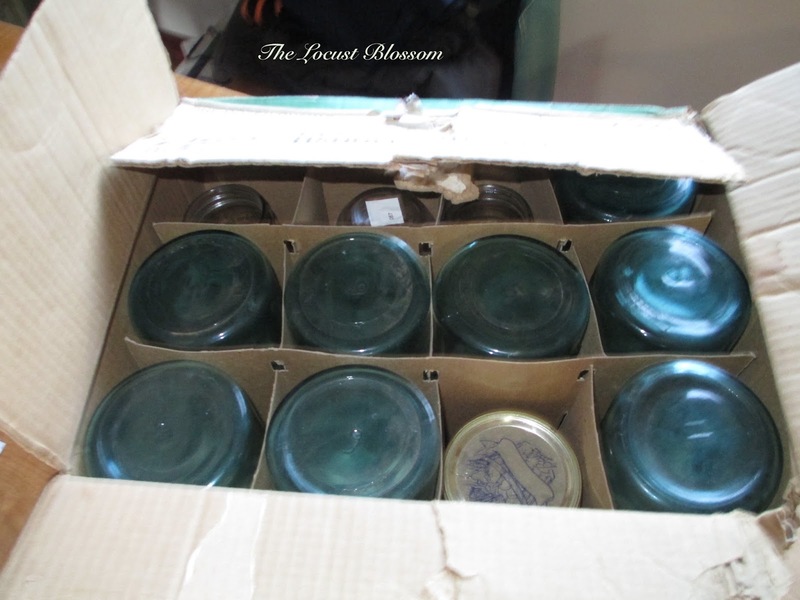 This year I was also gifted with a bunch of jars and a pressure canner!!! I am going to need to learn to use it. Your post is a great inspiration!